Corporate principles of Interprotein is "the contribution to health and welfare of humankind by supplying medicines to patients in all over the world, and Interprotein is engaged in business with a management vision of "the discovery of innovative medicines that are widely used and not burdening patients with heavy costs". As illustrated below, Interprotein is focusing on "Drug Discovery" and the main targets were "protein-protein interactions(PPIs)". "PPI-targeted Drug discovery" consists of two platform technologies-based research&development of new molecular entity(PPI inhibitors). 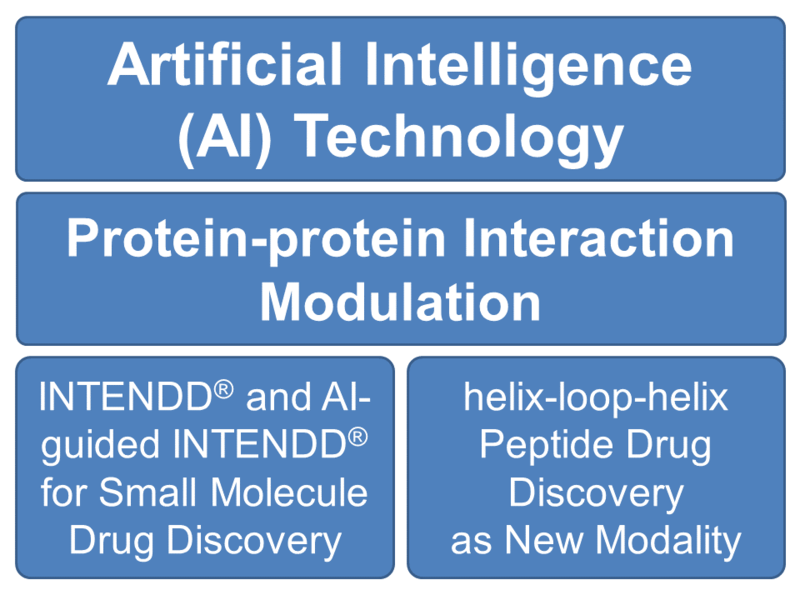 One of the two technologies is a unique in silico molecular design concept, INTNDD(INTerprotein's Engine for New Drug Design) and the other one is a hellix-loop-hellix type of conformationally-constrained peptide.